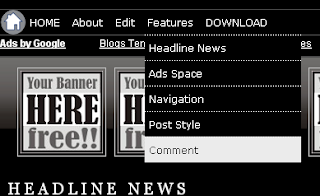 Horizontal dropdown menu is available at this Newspaper template. You can add your menu and sub menu. If you don't have a sub menu, you can just use a menu. How to edit this horizontal dropdown menu, read here. This is link to your Previous, Old and Home page.